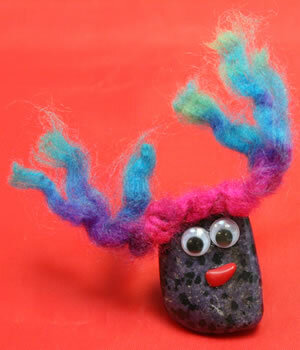 Making Tumbled Stone Critters Is a Fun Activity to Do With Kids! 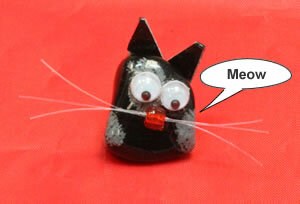 All of our tumbled stone critters were made from the tumbled gemstone mixes that we sell. 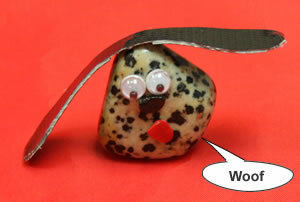 You can make your own stone critters. All you need to do is pick up a few supplies at your local craft store and let your imagination go wild. A piece of snowflake obsidian that now looks like a cat. 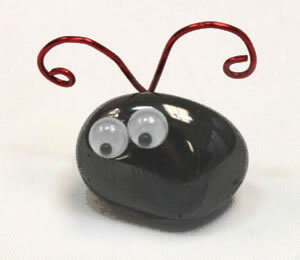 Heavy D. the hematite bug. This is our purple headed, crazy hair, dyed dalmatian stone rock man. 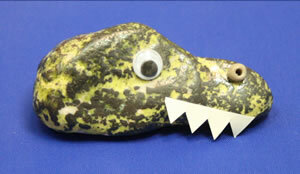 Chomper the dinosaur head is a piece of tumbled magnetite with another unknown material. 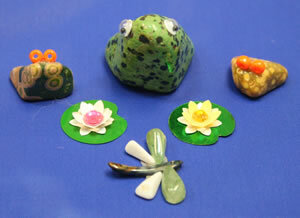 In this photograph the two smaller frogs are tumbled ocean jasper and the large frog is dyed dalmation stone. The dragon fly is a mix of different tumbled stones. Floppy, our dalmatian stone dog has polished red jasper for a mouth and a deep purple piece of tumbled amethyst as a nose. 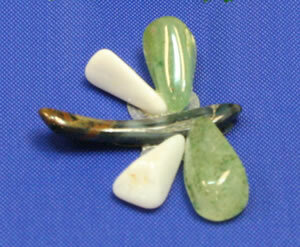 This dragon fly is made up of three different tumbled stone types. The body is tumbled tiger eye. The front wings are green aventurine and the back wings are howlite.